Rats can transmit diseases directly to your dogs and cats, or as hosts to disease-transmitting parasites. As long as you properly care for your pet rat and keep its living conditions clean, the odds of your canine and feline friends obtaining any infection from him are low. Your larger concern is an unwanted rodent family that takes up residence near your home, or that your dog and cat finds -- dead or alive -- in his outdoor adventures. A common mode of disease transmission from an unwanted rat to your beloved dog or cat is through ectoparasites -- parasites such as fleas, lice, mites and ticks that find their way onto rats. Some of these passengers, such as lice, prefer specific animal hosts and will not trade their rat host for your dog or cat. However, mites occasionally will, and can thus give your dog or cat a skin condition called mange. A tick carrying tularemia (rabbit fever), Lyme disease or Rocky Mountain Spotted Fever that finds its way from a rat to your dog or cat can transmit those diseases to your pet. Fleas can also infect rats with the respiratory disease known as plague -- both bubonic and septicemic -- and typhus, transmitting them to your pet through their feces or biting him. Your cat is far more susceptible to plague than your dog. Cats can also pick up the organism, Bartonella, responsible for the dreaded cat scratch fever, but this rarely causes cats to get sick -- just the humans they scratch. If your dog or cat gets scratched or bitten by a rat, he’s at risk of getting bubonic plague, tularemia and although rare, the monkeypox virus that’s similar to smallpox. 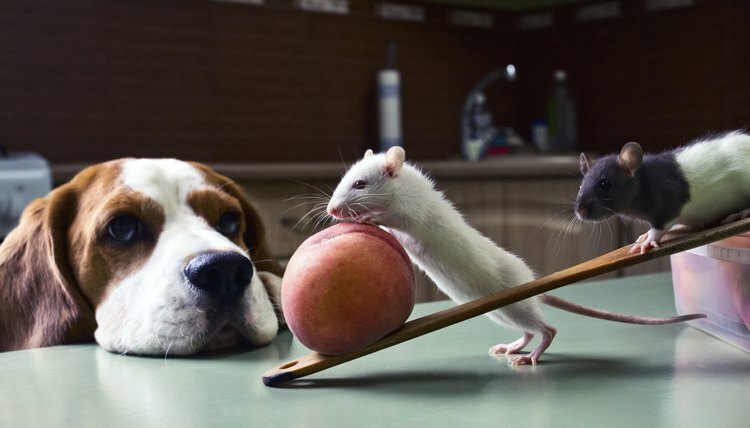 But the rat doesn’t have to have a specific infection to spread a disease through a bite; the rat’s normal flora in their mouths and noses can carry a bacteria that causes a disease known as rat bite fever in dogs and cats. Fortunately this disease is rare in the United States. Your dog and cat can pick up tularemia or monkeypox if they eat or just chew on an infected or contaminated rat. They also risk getting Giardia or Cryptosporidium, which are intestinal parasites and can make them ill, as well as the bacterial infections salmonella and Campylobacter. Fortunately these are rare. It may be hard to imagine a scenario in which your dog or cat would ingest rat urine or feces, but it could occur if they drank stagnant water with these rat excretions, or eating something similarly affected. In this instance, they risk exposure to the leptospire bacteria, causing leptospirosis -- an infection in the liver and kidneys. This is a bigger worry with dogs than with cats. The best way to prevent your cat or dog from getting rat-related diseases is to control your environment so that it’s unappealing to rats, and keeping your dogs and cats vaccinated and healthy. Keeping them indoors will also limit exposure to rats as long as the indoor environment is rat-proofed as much as possible. The effects of any of the diseases range from mild to potentially lethal, so being mindful of any variations in your pets’ usual behaviors and habits, such as lethargy and decreased appetite, will increase your chances of a proper diagnosis and full recovery. Second Chance Wildlife Center: Rats! !